Cancer Lessons From A Network Of Exceptional Responders : Shots - Health News A Harvard Medical School project aims to become the first national registry for exceedingly rare cancer patients who respond mysteriously well to treatments that failed to help others. "If my life were to end next week ... 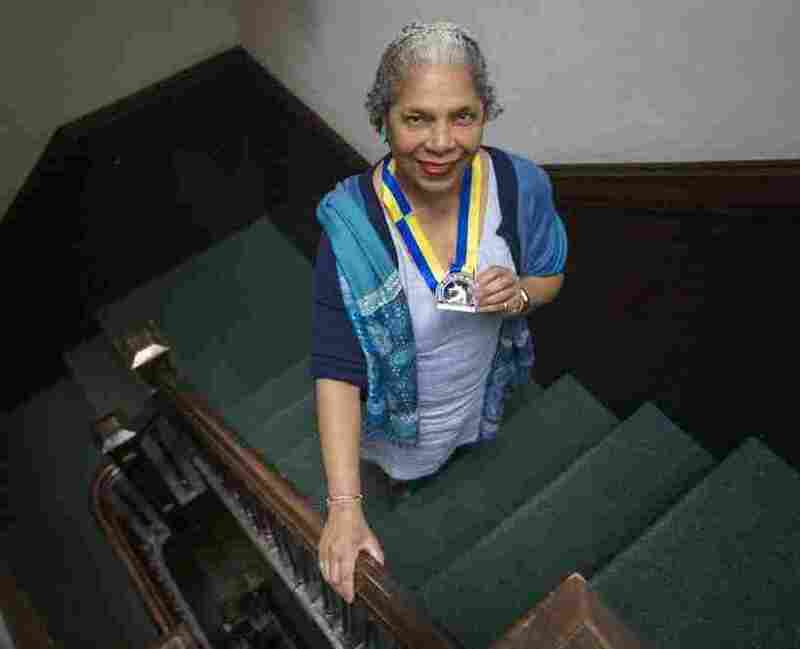 I want to feel like I have made a contribution," said Carol Martin, seen here holding her 2018 Boston Marathon medal. Carol Martin is 67 and has advanced, inoperable pancreatic cancer. "I have a particularly virulent form of that disease," she said. "I have squamous carcinoma, which means, according to my doctors, ordinarily the diagnosis to death is usually two months. "This June is two years out from my diagnosis." Not only is Martin back at work as a Harvard research administrator, she also finished this year's Boston Marathon amid the high winds and pouring rain. "We had headwinds, we had crosswinds, they had water running on the street," she recalled. "They had people dropping out like flies." But she made it. She speed-walked the course and reached the finish line in just over seven and a half hours. Clearly, Martin is no ordinary pancreatic cancer patient in her response to treatment. But what is the key to her medical superpowers? That's the type of mystery that a project called the Network of Enigmatic Exceptional Responders will try to solve. Based at Harvard Medical School, the project aims to become the first national registry for exceedingly rare cancer patients who beat overwhelming odds and respond mysteriously — even uniquely — well to treatments that failed to help others. Researchers will gather masses of data on just about everything about these patients in hopes of finding patterns that can explain what went right. Their responses are "so different, so outlying from any other clinical experience," said Dr. Zak Kohane, co-founder of the new network and chair of Harvard Medical School's Department of Biomedical Informatics. "It's a dramatic signal. So we know there's something there — but what is it?" "There are theories around your genome," Kohane said. "There are theories around how your immune system is reacting. Maybe it's the way your environment reprogrammed your immune system. It could be your diet, your exercise pattern, it could be any combination thereof, or maybe which drugs you took before — it's hard to know." So the idea behind the new network is: Look at everything you can. That begins with deep analysis of the patient's DNA, and the tumor DNA, and other biological features — proteins, metabolism, gut microbes. Add in medical records. And lifestyle, including attitude, even religion; and ZIP code to check for environmental factors like air and water pollution; and even posts on social media. That's a lot of disparate data, but Kohane said that's not an obstacle. "We're able to look across multiple data types these days," he said, "and make computers sweat at what they're good at, which is lining up the data and looking for patterns." This big a data crunch has only become possible recently, said Dr. George Q. Daley, dean of Harvard Medical School. "We can sequence the DNA of not just an individual but of 100,000 cells within a tumor," he said. "And that gives us an enormous advance in the concentration of data. There are many other analytics that today are sophisticated [and] five years ago weren't." Daley believes the data can point them to important lessons. "We hope that with the collective of information, and the power of data-driven science, that we'll be able to glean associations that we wouldn't have imagined," he said. The National Cancer Institute announced an "Exceptional Responder Initiative" in 2014, and reached out to cancer specialists to collect cases. It gathered tissue samples to analyze from more than 100 patients, and NCI says it has stopped accepting new samples. But this is the first attempt to create a national registry of exceptional responders across cancer types. It's also the first to reach out directly to patients and offer them control of their own data, so they can download it and share it with other researchers if they choose. Which patients are accepted to the project will vary, Kohane said, depending on the cancer. "If it's 10 years out from your breast cancer diagnosis, and you're doing fine, thank God, you're not that unusual," he said. "If you're 10 years out from a metastatic lung cancer, and you're alive, you are a miracle. And so these statistics have to be done per cancer, per treatment." The new network is also a first in that it plans to invite pharmaceutical companies into one arm of the project. Japanese pharma giant Takeda, whose cancer unit is headquartered in Cambridge, Mass., has already joined and provided a million dollars, which was added to initial funding from Harvard. The project will be open to other companies as well, with the idea that they will enroll their own patients and share their data in a common registry. Traditionally, exceptional responders have gotten little attention from pharma because they were anomalies: A drug trial fails if it only gets one good response. "It is time to look at the math a little bit differently and say that, back in the day, an outlier was just an outlier, but something is going on," said project co-founder Eric Perakslis, formerly at Takeda and now at the health data firm Datavant. "There's some reason they got better. We may or may not be smart enough to figure it out, but we're not going to know unless we look." Takeda has many examples of patients who "have either stable disease for a really long time, or they are in almost complete remission," said Sunita Badola, director of functional Genomics at Takeda. "And some of these drugs didn't make it to the market. Those are the patients who would qualify in this initiative." Dr. Vinay Prasad, an oncologist at the Oregon Health and Science University and a prominent public skeptic among cancer specialists, said it's a worthy goal to try to learn from the luckiest patients — but the unluckiest need studying as well. It's important in science to learn from the extremes, he said, and that's what the network is trying to do. "So I encourage them to do that," Prasad said. "But I think you should look at both extremes — the people we don't do a good enough job for — and I'll tell you, as an oncologist, I think they're very easily forgotten." For now, even looking only at the best responses to treatment, no one expects this project to be simple. Take Carol Martin and her pancreatic cancer. She thinks one key element for her was her treatment protocol, including a new chemotherapy. Her Harvard Medical School colleagues were advocating for her, she said, and "this is a leading, bleeding, cutting-edge place for medicine." But she cited other possible elements: She meditates. She gets massages, and lots of exercise and loves connecting people. When other patients facing pancreatic cancer ask her advice, she tends to give them a list of everything she's done. But she hopes the new network can turn up more specific insights that could help others. "If my life were to end next week — because the nature of the disease that I have, it's possible that it could do that — I want to feel like I have made a contribution," she said. "I think I'm alive to do this thing, to help people in this way that I'm uniquely positioned to be able to do." Several other exceptional patients like Martin have already caught word of the project and reached out to join the network, Kohane said. Now that official enrollment is beginning, he hopes a few hundred more will enroll in the coming months, and that their data will lead to new insights within the next couple of years. The original version of this story ran on WBUR's CommonHealth.